Web has become one of those words that has taken on an entirely new meaning now that the Internet has come to stay. 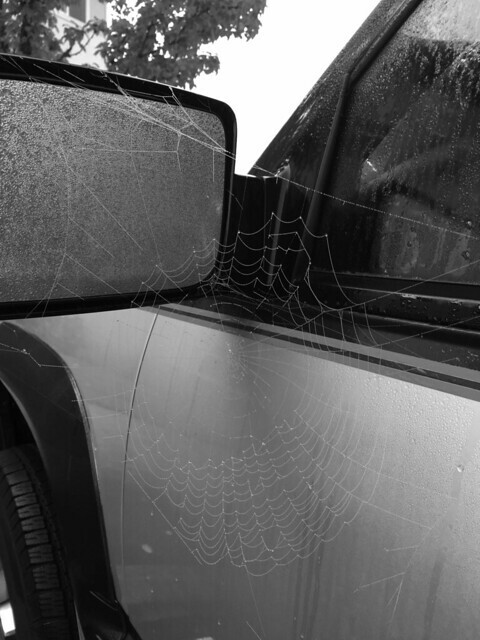 But those of us who live in Oregon will forever and always be reminded of the original web, as in spider web. They are everywhere, the handywork of those industrious spiders we’re not supposed to kill for some reason. I pulled into a parking spot next to this car. Who knows how long it had been parked in the Friendsview lot, but long enough for Charlotte, or one of her long-lost relatives, to create this dinner trap. I wonder if a little research or a “location, location, location” seminar could have saved her the effort of setting her trap in such a tentative place. Have you ever watched a spider at work? I think it’s one of the wonders of creation. And so thoughtlessly I swing my arm to destroy the one in my path. YES, they used to spin webs right in front of my kitchen window at 3105 and were an endless source of fascination. I also had a spider I called my “kitchen spider” that happily lived in the frame of the very old kitchen window–I hope the new tenants let him stay!